With the dozens of traffic lights and congestion, driving in Oakland can be frustrating and stressful. But every so often, you can time it perfectly and breeze down Forbes or Fifth Avenue, passing through a string of green lights. Stephen Smith, director of the Intelligent Coordination and Logistics Laboratory at CMU, developed technology that could make that breezy drive a lot less rare — but some worry it might come at the expense of pedestrian convenience. The technology — called Scalable Urban Traffic Control, or Surtrac — works by combining traffic light control with predictive traffic technology. It prevents drivers from getting stuck at a light with no traffic passing through from the cross street, easing congestion. And with its ability to read and adapt to existing traffic conditions, its producers say it will drastically reduce lengthy travel times and vehicle emissions. 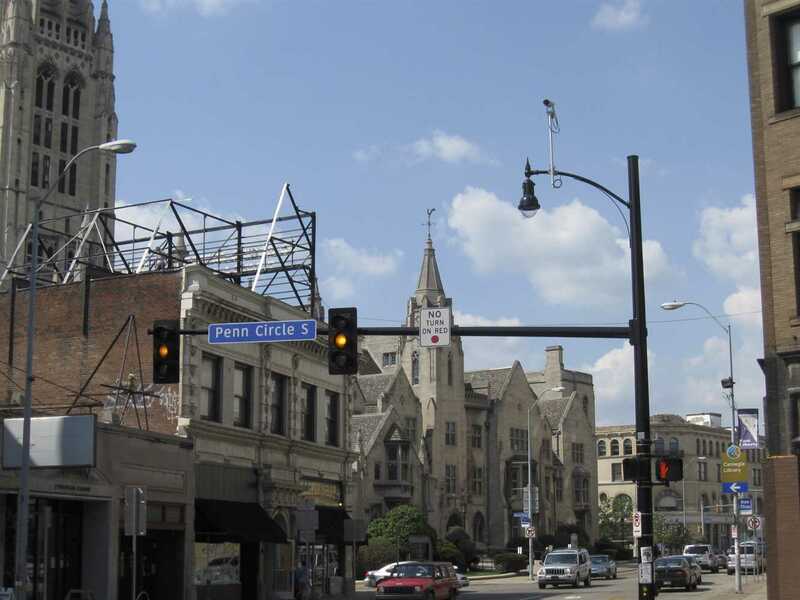 The City of Pittsburgh and PennDOT are investing $30 million to install these adaptive traffic signals in 150 intersections around the City, in addition to the 50 signals currently in operation. By 2019 or 2020, nearly 200 intersections — a third of Pittsburgh — will have smart signals installed, Smith said. Smith played a major role in developing this technology. He and his team received funding in 2009 from the Henry L. Hillman Foundation to brainstorm ways to improve Pittsburgh’s traffic problems and implement solutions. Smith’s team at CMU pilot tested the technology at nine intersections in East Liberty in June 2012, performing physical drive-through experiments using their cell phones to track their travel times before and after they went in. They received additional funding from the Heinz Endowments because of the pilot program’s success, Smith said. Assuming the expansion goes as planned, this technology will expand through Oakland, helping to ease congestions that commonly infect its entering and exiting roads — namely Bates, Forbes and Fifth. Currently drivers can make every light traveling down Forbes or Fifth if they time it correctly and go at the right speed. But Smith pointed out that when it’s congested “traffic suffers.” The smart light technology would help that, he said. “It will be adjustable to whatever the actual traffic is on the road, so it should be noticeably better,” he said. While many are enthusiastic about shorter drives, some are skeptical about its effect on pedestrians and cyclists, and Smith is aware of these concerns. He said safe intersection-crossing for people with disabilities is the top priority in fixing the traffic problem. He and his colleagues recently contracted with the Federal Highway Administration to build a prototype mobile phone adapted to talk with the intersection and provide these phones to pedestrians with a disability. The team is set to test this technology next June or July. “The phone will know the speed of the owner, then the signal determines how much green time that person needs,” he said. Although the team is currently developing a solution to pedestrian concerns, Todd Derr, a member and volunteer for the organization BikePGH, remains skeptical from his personal experience with existing Surtrac traffic lights. He said pressing the walk button doesn’t seem to speed up the light change for pedestrians. “Sensors aren’t necessarily going to fix [the problem] unless they change something else about their system,” Derr said. Because the technology works to speed up travel by adjusting to existing traffic, small side streets might get green lights less often, assuming it’s a busy time for a street like Fifth Avenue. Though this would speed up drive times, a pedestrian would have to press a walk button and wait for the system to give them a walk signal. “I think, from my observation, the practical effect of this just encourages people to jaywalk,” Derr said. Colleen Hutzel, a Pitt junior and social work major, said she thinks the Surtrac system’s promise to make travel times faster and reduce emissions will have positive impacts for our health and our environment. But as a student who walks to class, she said she thinks Surtrac could negatively affect pedestrian students. “From my place, it takes 15 minutes to get to campus, assuming I’m walking fast. Crossing Fifth and Forbes will make my walking commute longer,” Hutzel said. Despite what Hutzel and Derr feel are shortcomings, Surtrac technology has been anticipated by many, including Evan Ivosevic, a communications major who commutes from McKees Rocks. “I’ve been waiting on this tech since high school, which was five years ago,” Ivosevic said. Taking into account concerns from different groups, Smith said his team is working to ensure Surtrac meets the needs of everybody. “Our technology is pretty unique in its ability to do this multi-mode optimization — by mode I just mean pedestrians, bicycles, busses, cars — giving each of them attention and considering them along with the particular constraints that each have,” Smith said.